Testimonials are an important marketing tool. They lessen skepticism, describe the client experience, and set the stage for great results. A good testimonial helps clients feel good about buying from you. 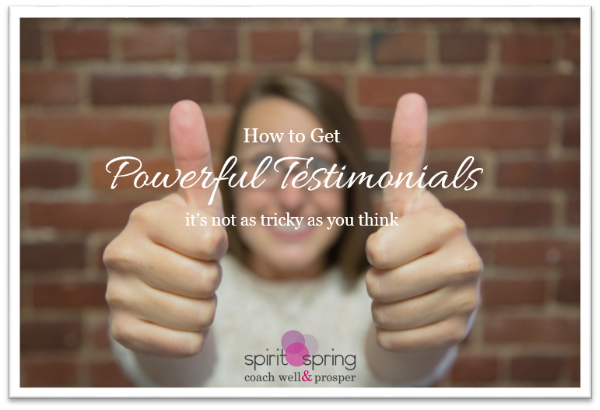 The problem is that many people don't know how to get OR give great testimonials. Most testimonials are too vague--“I like her style” “He’s a great coach”--or too hyped “Fabulous! One in a million!” to be useful. But getting a powerful testimonial isn't as tricky as it sounds if you keep a couple of things in mind and take charge of the process. Earn it. Of course, the first step is to deliver on your customer's expectations. Let your client know that you intend to earn a glowing testimonial from them. Listen for it. When a client gives you positive feedback, ask if you can quote them. Don't expect people to know how to write a good testimonial. Provide a worksheet with specific questions and edit their answers into a testimonial. Ask for specific, concrete information. The more specific the answers, the more believable the testimonial will be. I'd love to get a testimonial from you. I know your feedback will help others get an idea of what to expect when they work with me. Writing a testimonial can be tough, so I came up with a list of questions to help the process along. I’ll edit your responses into a short statement and send it back for your review. What was your situation like before you worked with me? How bad was it? What problems were you facing? How did that situation make you feel? What were some of your concerns or worries about hiring a coach? What were you afraid of? Why did you choose to work with me instead of someone else? What was it like working together? What were some highlights of that experience? What was different about this experience compared to other experiences you’ve had in the past? Would you consider working together again, and why? What concrete results did you get? How do you feel about your results? What other things are different, or what’s changed? What does your future look like now? Who would you recommend me to? As soon as you get the worksheet from them, edit their answers into a couple of short paragraphs. The goal is to tell a story that describes what it was like before, during and after working with you. You don't have to use every word; just make sure the testimonial stays true to their experience. With a little bit of pro-active planning, you can have consistently powerful testimonials from each client you work with, and more new clients lining up at the door.